This year's model. You'll look smashing in it! 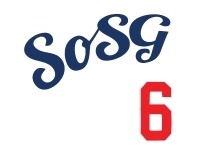 The SoSG softball team needs you! We play to have fun — no pressure to win or anything (just check our past results). Click here to register. Event is Saturday, April 11, at Big League Dreams in West Covina. Proceeds benefit the Los Angeles Mission. 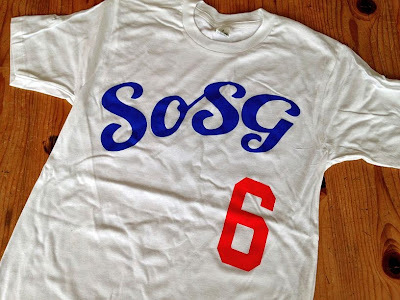 All players get a bitchin' SoSG T-shirt! Can I wear jeans and converse? Team Killeen will be there, but only Scott will play. No need embarrassing our blog. I will provide moral support, and call the other team players and the umpire nasty names. Time to see what you can do behind the camera, BJ! Does this mean the Killeens will be photogging US? I'm ready for my closeup! Done and done. I love the "home" unis. Make us look good, BJ! The first year, I think we lost our three games by a combined score of like 66-13. Last year we managed to win a game and narrow the gap in run differential somewhat. Based on that trajectory, and figuring for fancy sabermetrics, we're probably gonna take the whole damn thing this year! That or we'll just be drunk off our asses by the end of the first game. Either way, we're winners. We actually scored 13 total runs??? All SOSG faces will be blurred to protect your identities from the authorities. i'd love to play but i'm officially retired from all athletics except doing beer runs. No Dodgers- Gnat thread? wassup wit dat? That first year included a matchup with Jenny Finch and Lisa Fernandez and their ringers. We won on BAC though. Cant wait to play with you guys, sounds like my kinda team!